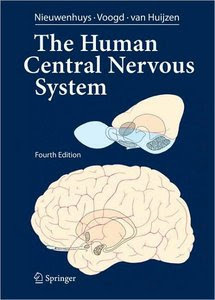 R. Nieuwenhuys, J. Voogd, C. van Huijzen "The Human Central Nervous System"
This book has become a classic in its field. The outstanding illustrative material still represents its main feature: 375 halftones and line drawings comprise a complete and convenient atlas for the interpretation of neuroimaging studies. Yet the text of this fourth edition has been thoroughly revised and expanded. Fifteen newly written chapters introduce illustrations of the gross anatomy, the blood supply and the microstructure of the central nervous system and deal with the development, topography and functional anatomy of the spinal cord, brain stem and cerebellum, diencephalons and telencephalon. This new edition provides a clear and reliable guide to the structural and functional organization of the human central nervous system and its broad basis in descriptive and experimental neuroscience. Intended primarily for students of medicine and psychology at all levels, the book is also informative reading for practicing neurobiologists.